As part of the ARISS program, we were able to successfully organize and carry out on March 21, 2012 a QSO (radio contact) between electronics and poly mechanics learners from the Air Base Training Center in Payerne (Switzerland), and the astronaut from ESA André Kuipers, PI9ISS, aboard the ISS International Space Station. The learners had already been working for months, as requested by the ARISS project, on a technical project in the form of a stratospheric balloon payload. Their work was honored on March 15, 2012, with the successful launch of the probe. radio amateur APRS specialists (Automatic Packet Reporting System). 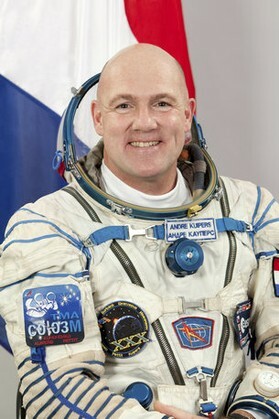 The buttons on the top of the page will allow you to discover the technical project of the electronics students, the QSO with astronaut André Kuipers aboard the ISS and our main partners. The organiing board of "Operation ARISS-2012"
On March 15, 2012, the board organized a press conference with Claude Nicollier HB9CN, Swiss astronaut and member of our club, as well as representatives of the military aviation museum "Clin d'Ailes" and the Centre de Formation of the Air Base Payerne.